Get back in my Ops Info logo where you belong, Soa! Upon release, the Eternity Vault was the only operation available and I’m sure most players can attest to the bugs that were littered about. Would it be bad form to point out that some of them are still there? Who can forget the frustrating bug in Ancient Pylons where the panels would not allow you to advance to the next section of the puzzle? 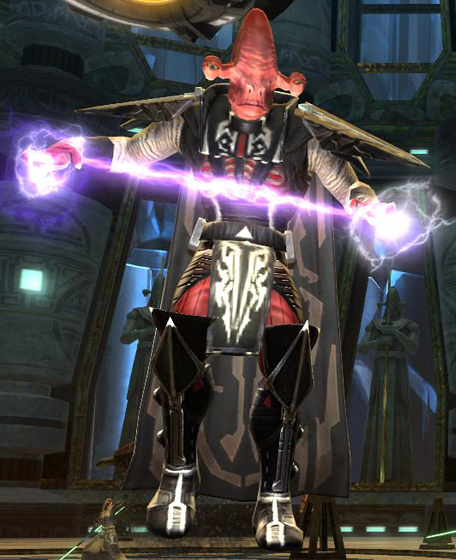 Or how about the bug that caused Soa’s Ball Lightning to do double their intended damage in Hard Mode? That is, of course, if he even reset properly after a wipe. 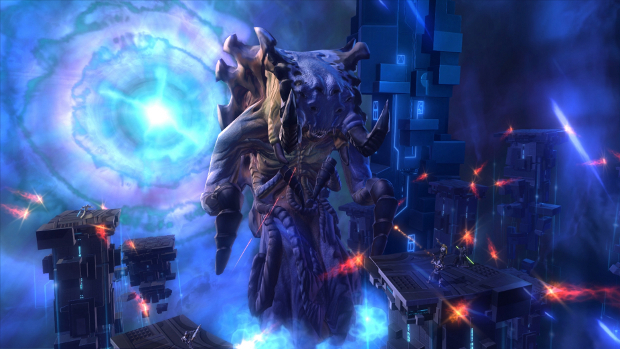 Bugs aside, though, Soa was one of the most challenging and difficult bosses to defeat with the current gear at the time. The rest of the bosses in EV not so much. 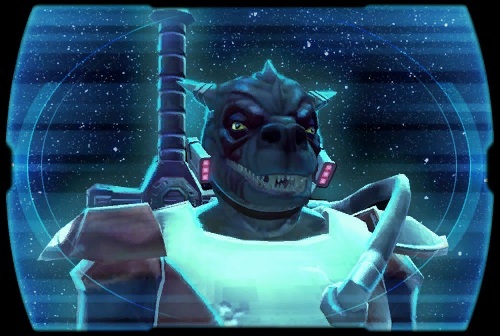 The Annihilation Droid could be troublesome, but it didn’t have the RNG fighting against you like Soa did. Even so, I still think the Soa encounter was one of Bioware’s finest efforts, especially for their first operation. It had multiple phases and mechanics with tons of things going on which made you have to pay attention. I still want that hat! The following month saw Patch 1.1 released and with it came a new operation: Karagga’s Palace. I’m sitting here trying to think of any bugs that were in this operation, but none are coming to mind. It was very fun and amusing to run, especially with that protocol droid talking your ear off. Bonethrasher was hilarious as were Jarg and Sorno. “Which one is the little one? They’re all little!” They also were one of the bigger challenges in Nightmare Mode. The Foreman Crusher wasn’t terrible, but the show stopper for the longest time was the Heavy Fabricator (puzzle) encounter. I don’t know how many times I have heard of operation groups breaking up due to this fight. Eventually, people found out different methods of doing the puzzle, but it was a challenge for the longest time for many guilds and groups. Oddly enough, the final boss was pretty straight forward which is a nice way of saying ‘easy’, even on Nightmare, if you were properly geared. This is where we learned that all Bioware was doing to call something ‘Nightmare Mode’ was to give the bosses more health and make them hit harder. This would change, but not for a very long time. A few months later we received Denova in Patch 1.2. I have mixed feelings about this operation. On the bad side, I felt it had too much trash and not enough bosses. We were shorted one compared to the operations before and since. Also, for the next five months this is the only operation we had. 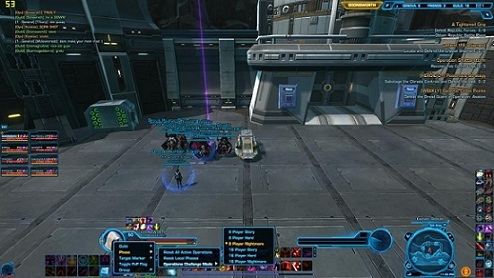 We’re so sick of this place that after we killed Kephess on Nightmare a couple of our operation group would be happy to never go back in there again. Not because it is difficult, but because they are so sick of the place. Fortunately, the encounters here were pretty challenging to learn the mechanics and it is, by far, my favorite environment in terms of scenery. I especially love the battlefield that you fly over on your way to the drop off point after Colonel Vorgath. Speaking of the bosses, I thoroughly enjoyed learning these fights when they were still new. The mechanics that were introduced in this operation definitely showed that Bioware was learning from their previous operations and brought them to the next level, so to speak. If only it wasn’t around for five months with nothing else to do… ugh…. I still say he’s smiling at us. After a long wait, Patch 1.3 dropped with Terror From Beyond! Hooray! Even though it has been out for three months, this operation still seems fresh to me. I don’t know how I will feel about it in two months time, but when I compare it with Denova after three months it seems to sit more favorably. I don’t know if it is due to the way the encounters are designed or if I am just happy I am not running EC, but I still look forward to doing this operation. Bioware has come a long way since the Eternity Vault and it really shows in how well this operation plays. The fights are fast paced, challenging and each boss is different and fun. I am looking forward to seeing how they develop the Nightmare version of this ops. I have to toot our ops group’s horn. Downed 12-16-2012. Finally. As we look over the past year I feel confident that Bioware’s skill in operation development has grown tremendously. I look forward to Makeb and whatever operation the new expansion brings. If they keep the pace they are currently on I feel confident that this time next year we will be singing more and more praises to them. I am interested to see how they handle the level cap raise and the gear progression for operation, but for now I’ll continue to enjoy the operations we have. Merry Christmas and Happy Holidays to you all! Ready check done? 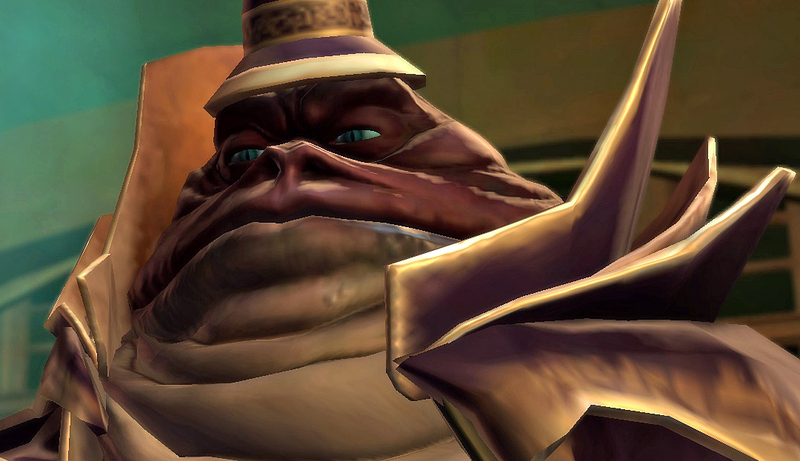 Pulling in 3… 2… 1..
HoloNet Links Imperial Analyst: Is the Community Unfair and Misinformed?